I believe that at some level each of us desires to live our lives with passion, power and purpose. Those 3 little words really hold a charge and with them a desire to step up and bring every facet of our lives into alignment with our own passion and purpose. One of my many passions is stones. It’s one that I have been exploring and embracing for as long as I can remember. But it wasn’t until I committed to creating gemstone jewelry that I began to feel the power of their transformation. For the past several months I have been taking time to connect with each of the unique stone types in my collection…to photograph it, listen to its message, and then share that message. It’s been powerful. I have learned so much and this little journey has transformed how I work with stones. My most recent study has been pyrite. This heavy little stone packs quite the punch. When I wear it I feel like my internal battery is charged. I’m focused, on task and I flow from one activity to the next with minimal distraction…it’s like a cure for my creative spirit that often feels a bit add. Not only does it keep me focused, but it seems to be a master manifestor. Yes, I did actually say that. Pyrite is a master manifestor. Every time I place this stone on my wrist I become clear about my wants, desires and dreams…and not only that…my experience of life is coming into alignment with those desires. It is incredibly refreshing. 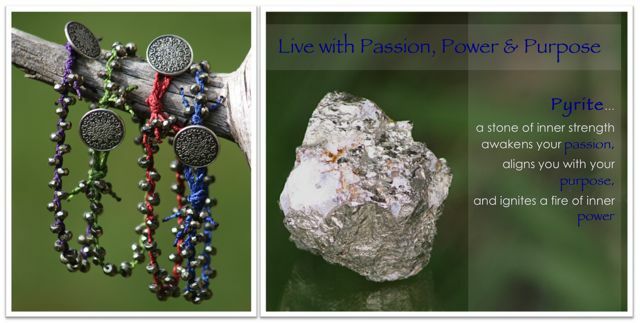 This entry was posted in Blog and tagged Bracelet, Dream, Gemstones, Journey Jewels, Lori Andrus, Manifest, Manifestation, Passion, Power, Purpose, Pyrite, Pyrite Jewelry by loriandrus. Bookmark the permalink.